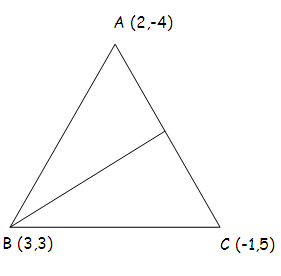 (14) If the vertices of triangle ABC are A (2,-4) ,B(3,3) and C (-1,5). Find the equation of the straight line along the altitude from the vertex B. A line drawn from the vertex B is perpendicular to the line AC.So the product of their slopes will be equal to -1. (15) If the vertices of triangle ABC are A (-4,4), B(8,4) and C(8,10). Find the equation of the along the median from the vertex A. 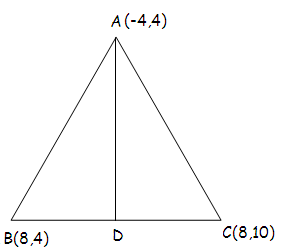 Since AD is median,it passes through the midpoint of the side BC.